Sandra Jauregui wanted to forget being shot at during the Oct. 1 mass murder, but the Parkland school shooting instead prompted her to do something to stop gun violence. CARSON CITY — She survived the Route 91 Harvest festival shooting. But in the days, weeks and months following, Nevada Assemblywoman Sandra Jauregui did not want to be the one leading the way on gun control in the state. No, she wanted to forget that night ever happened. In the aftermath of the shooting that left 58 people dead and more than 800 wounded, Jauregui “completely shut down.” She found herself sleeping for 17 hours a day and unable to find the words to talk even to her family and closest friends about what she had experienced. Five days after the shooting — at the advice of a counselor — she put her feelings in writing in a letter to her loved ones. 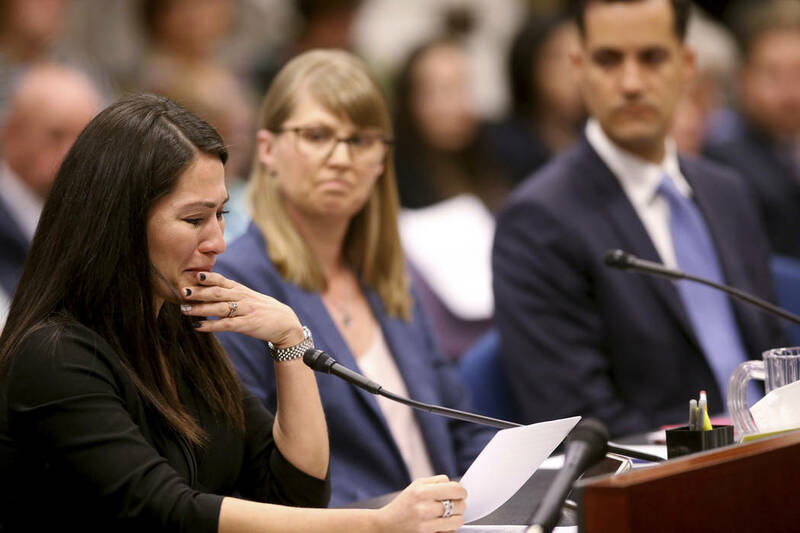 On Monday, 18 months after the shooting, Jauregui read that letter aloud while presenting Assembly Bill 291, which is aimed at banning bump stocks — the device used by the Route 91 shooter to unload more than 1,100 rounds into the crowd in just minutes. The bill would also give local governments the autonomy to pass their own gun laws. Jauregui, a Las Vegas Democrat, was one of the 22,000 at the concert and was with her friends and then-fiance, now-husband. They found themselves near the front of the stage for Jason Aldean’s performance when first shots rang out from the 32nd floor of Mandalay Bay, where the shooter was perched with several semi-automatic rifles equipped with bump stocks that allowed the weapons to simulate automatic fire. Jauregui became “more silent” on gun control after the shooting, she said. But when 17 people, including 14 teenagers, were killed in a school shooting in Parkland, Florida, a little over four months later, that changed. “I knew I couldn’t stay silent. I was infuriated and angry that these children had to face something so awful that me, a grown adult, could barely deal with,” Jauregui said. On Monday, Jauregui led the way in introducing the bill in front of a joint meeting of the Assembly and Senate judiciary committees. The three-plus-hour hearing mirrored what has become commonplace for gun debates both in Nevada and nationally. 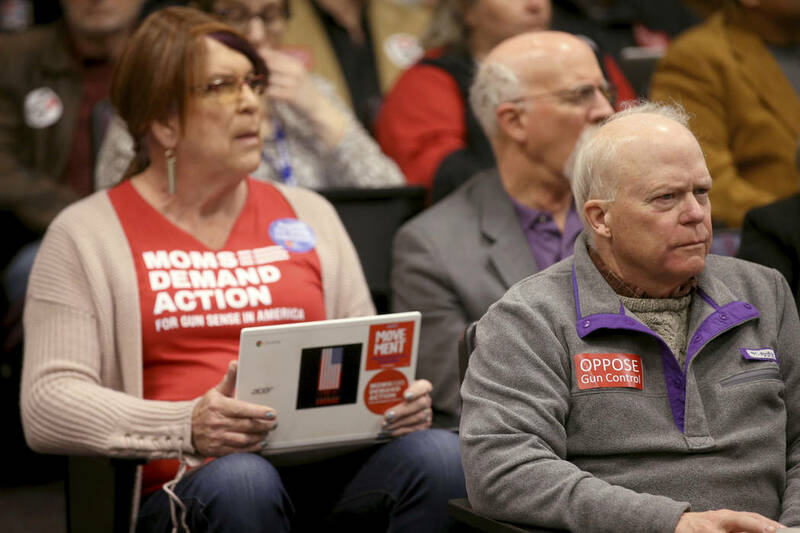 Supporters of the bill gave impassioned and emotional pleas that often involved personal experiences with gun violence, from the perspective of both survivors and the hospital workers who worked to save the hundreds of gunshot victims that night, while opponents derided the measure as an unconstitutional infringement on their Second Amendment rights. AB 291 would make three key changes to Nevada gun laws. First, it would ban bump stocks or any other devices that would allow a semi-automatic firearm to simulate automatic fire. Second, it would give local governments the ability to pass their own gun laws, effectively overturning a state law passed in 2015 that put all gun legislation in the state under the purview of the Legislature. And third, the least controversial part of the bill would lower the legal blood alcohol content allowed for a person carrying a gun from 0.10 to 0.08 percent, putting the threshold in line with the state’s drunken driving limits. Todd Sklamberg, the chief executive officer of Sunrise Hospital and Medical Center, detailed the kind of carnage that bump stocks were able to inflict as he recalled the scene from the hospital in the hours after the shooting as hundreds of victims poured through the doors. He remembers walking into the emergency room and noticing a woman just to his left — a bullet hole right between her eyes. Blood covered the floors. “Not red with just drips of blood, but with pools of blood,” Sklamberg said. Sklamberg said that Sunrise treated 242 patients, 124 of whom had been shot. Fifteen were “either deceased or unsalvageable,” and two died in the hospital’s care — one of whom was on life support until his family from Arizona could make it to Las Vegas, and one whose aorta had been destroyed by a bullet, he added. “The community and the trauma center system is designed to provide what it did on that day. But we don’t want to test it like this anymore,” Sklamberg said before asking lawmakers to support the bump stock ban and the bill. A federal ban on bump stocks went into effect last week. AB 291 would codify that ban into state law. Dan Reid, a lobbyist for the National Rifle Association, said in opposing the bill that the proposed state ban “is well beyond federal regulations” and said that its “vague and ambiguous language” could lead to lawsuits. Some Republican lawmakers also questioned the language of the ban, which was worded in an attempt to cover devices that could be similar to bump stocks. Sen. Keith Pickard, R-Henderson, and Assemblywoman Alexis Hansen, R-Sparks, said they worried that the language would also ban modifications for guns that lower the force required to pull the trigger, such as those used by competitive shooters and some women. Jauregui said that was not the intent of the bill and said she was willing to work on the language with them to make that more clear. In the wake of the Route 91 shooting, Clark County and the city of Las Vegas looked into quickly banning bump stocks. But they were told that wasn’t possible, as a state law passed in 2015 put gun laws solely under the jurisdiction of the Legislature. The bill, Giunchigliani added, would “enable local governments to protect their residents as they deem appropriate. The bill’s opponents argued that the 2015 law was passed to provide consistent laws from city to city and county to county so gun owners would not have to worry about unknowingly violating a local gun law simply from going to a different city. “This is entirely problematic. Preemption is good law; it’s good for the citizens of Nevada,” said Reid, the NRA lobbyist. Lawmakers took no action on the bill Monday. WASHINGTON — A three-judge federal court affirmed Monday a Trump administration ban on bump stocks – devices used in the Las Vegas mass shooting in 2017 characterized as the worst in U.S. history. The U.S. Circuit Court of Appeals for the District of Columbia Circuit ruled 2-1 to affirm the Justice Department ban on the devices and issued by the Bureau of Alcohol, Tobacco, Firearms and Explosives. “The most deadly mass shooting in modern American history proved bump stocks are a serious threat to public safety,” said Adam Skaggs, chief counsel at the Giffords Law Center to Prevent Gun Violence. The Firearms Policy Foundation and other groups filed a lawsuit challenging the ban and sought an injunction to stop the new ATF rule from being implemented. Judges on the D.C. appeals court affirmed a lower court ruling on the ban, which was implemented last week. The majority of the appeals court allowed the plaintiffs several days to seek a stay from the U.S. Supreme Court. The justices on the high court declined requests last week to block the ban. A lone gunman, Stephen Paddock, 64, of Mesquite, fired more than 1,100 rounds in 11 minutes from his 32nd floor hotel room into a crowd of country music concertgoers on the Las Vegas Strip on Oct. 1, 2017. The shooting claimed the lives of 58 people, and injured hundreds of others attending the music event. Paddock had installed 13 bump stocks on semi-automatic rifles to increase the rate of fire of the weapons. Paddock died of a self-inflicted gunshot wound as law enforcement officers closed in on his Mandalay Bay suite. Under the new ATF rule, bump stocks will be regulated like machine guns. The rule allows owners of the devices 90 days to destroy the stocks or turn them over to law enforcement. The change in the federal rule on bump stocks followed adoption of laws in several states to ban the devices. Bills filed in Congress died in the GOP-controlled House and Senate last session. Republicans backed President Donald Trump in a regulatory change to outlaw the devices.